In this age of recession, where an estimated 660,900 businesses closed their doors in 2009 alone, we at Contract Furniture Company are humbled by and proud of our continued success. This year as we celebrate our 10th anniversary, we decided to take a look back at one of our most notable clients – The Beverly Hills Hotel in Beverly Hills, California. In December of 1992 the landmark hotel closed for a complete renovation. The project lasted two and a half years, with the hotel reopening in June of 1995. We were a part of these site improvements, providing arm chairs, chaise lounge cushions, umbrellas, and umbrella bases. 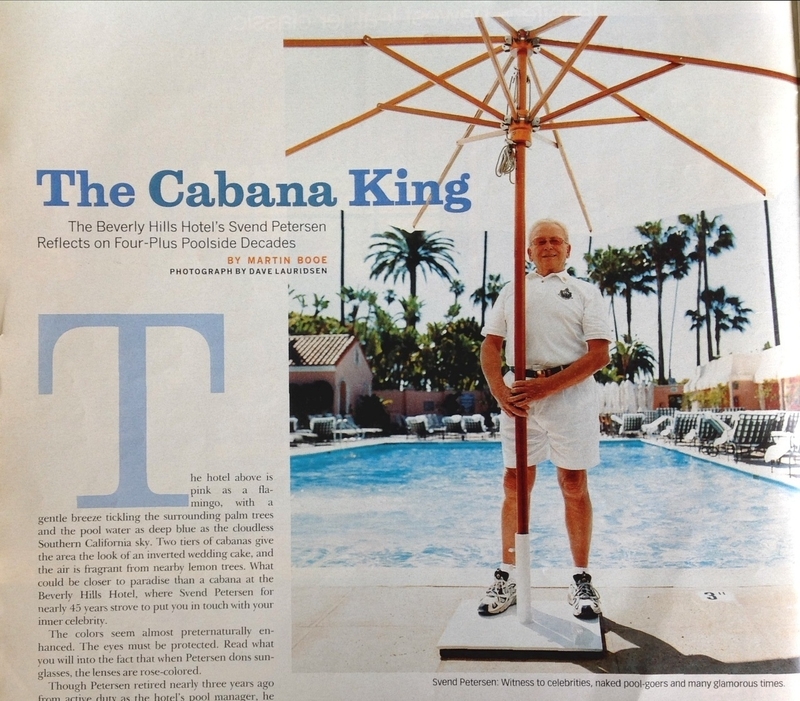 The following is excerpted from a Los Angeles Times Magazine article entitled The Cabana King, by Martin Booe. We hope you enjoy the blast from the past. “The hotel above is pink as a flamingo, with a gentle breeze tickling the surrounding palm trees and the pool water as deep blue as the cloudless Southern California sky. Two tiers of cabanas give the area the look of an inverted wedding cake, and the air is fragrant from nearby lemon trees. What could be closer to paradise than a cabana at the Beverly Hills Hotel, where Svend Petersen for nearly 45 years strove to put you in touch with your inner celebrity. “The colors seem almost preternaturally enhanced. The eyes must be protected. Read what you will into the fact that when Petersen dons sunglasses, the lenses are rose-colored. “He grew up in the frigidity of Denmark, mentally escaping the Nazi occupation by watching American movies featuring such stars as Buster Crabbe, Esther Williams and Johnny Weissmuller. From his youth, Petersen was attracted to water and sunshine. At 17 he joined the Danish swimming team. He put in two years at the American Embassy in Copenhagen as a waiter in the ambassador’s private residence, found an emigration sponsor, and in 1959 lit out for California, where he was hired as a lifeguard at the Beverly Hills Hotel pool. Three years later he was promoted to pool manager and made headmaster of a squad of white-clad cabana boys. “During the ’60s, the hotel and the pool were the domain of the movie folk–actors and actresses and “starlets,” a word whose passing from common usage Petersen rather laments. He made cameos in the movies “The Prize” and “Torn Curtain” and also nabbed roles in a few soap operas and commercials; he was not opposed to a career in Hollywood, though he eventually let go of that aspiration. “Over the years, the pool waters frothed with the grand celebrities, icons all: Cary Grant, Fred Astaire, Grace Kelly, Ingrid Bergman, Marilyn Monroe, Elizabeth Taylor. Petersen recalls a sweaty Katharine Hepburn, fresh from the tennis courts, doing a back flip into the pool, tennis clothes and all. The Beatles were sneaked in for a private dip. In the ’70s, the pool’s denizens were more likely to be from the music industry than the movie business, Michael Jackson and Dionne Warwick among them. “He encountered his share of eccentrics, such as the absent-minded movie mogul who walked into the pool area stark naked, so absorbed was he reading the trade papers. (‘Mr. Schlafer, excuse me, but you’re not wearing any clothes.’) The ’60s and ’70s presented their own challenges, as Petersen was required to announce as diplomatically as possible that the smoking of marijuana around the pool could not be tolerated. “Silicone notwithstanding, a few other things have changed. Petersen, for one, reckons the cellphone has taken a lot of the fun out of things. Back then, it was more about being seen, that unending square dance of drawing the attention of cigar-chomping moguls and people more important than you. In those days, there was a lot of paging done. “Paging Elizabeth Taylor! Paging Cary Grant! Whether they were there or not. It made things more exciting.” Now, the glitterati work their contacts over the cell while sipping their Fiji water in seclusion. “Ultimately, it always comes down to pleasing people, and this involves more than providing fluffy terrycloth towels, sun shields and the crackly frozen towels he began using to cool off guests a few years ago. Petersen recalls the day he learned this lesson, when he greeted a man with the standard, ‘How are you today?’ only to be told that it was none of his business.